Today marks the anniversary of the outbreak of World War II, and so today's pony book has to be probably the best pony book war story: Mary Treadgold's We Couldn't Leave Dinah, published in 1941. 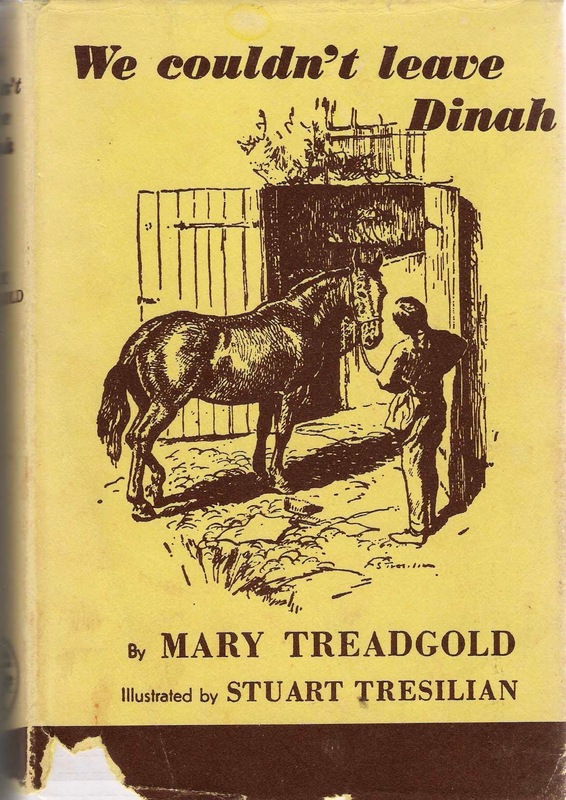 Mary Treadgold had considerable experience of the worst sort of pony book, because in 1938 she became Heinemann's first Children’s Editor. Joanna Cannan’s A Pony for Jean had come out in 1936, one of the first books to operate the girl gets pony plot. It was hugely successful, and success always attracts imitators. Mary Treadgold was deluged with pony manuscripts - "―a few, a very few, outstanding, the majority quite frightful.” She could, she thought, do better herself, and so We Couldn't Leave Dinah was written. “You couldn’t really believe in awful things like Hitler when you were out in sun and wind and sea-spray and with people as absolutely marvellous as the Pony Club. But not even the Pony Club is proof against invasion, or the traumas of evacuation. Caroline and Mick, in the confusion and panic, are left behind. Mary Treadgold shows conventional pony owning as the luxury it is. Both children quickly gain some perspective; despite the title, it is not the pony Dinah who is central to the story. Not only does Caroline accept the pony’s loss, she hands her over to the German girl, Nannerl. The focus switches from ponies as the central point of a privileged existence, to them as working animals, useful in getting done what has to be done―as horses and ponies had been used for centuries. In their time spent hiding on the island, the ponies are used to carry what they need when they hide in a cave before being able to escape the island; and as transport―to move around the island more quickly when they are attempting to find out the Nazi’s true invasion plans. The ponies’ position as part of life of the ruling class is emphasised by the German girl Nannerl, the young daughter of the German commander. Not only does her family take over the Templeton house, they also take over the ponies. But the ponies become the means through which the Templetons and Nannerl connect; the shared love of the horse being a common language, no matter who is the invader or the invaded. Nannerl does not see a daughter of the invaded, whom she must grind down: she sees a girl she would have liked to play with, and in the Pony Club, something she and Caroline could have done together. When Nannerl helps both Templetons escape, Caroline is able to take the extraordinary step of regarding Nannerl as more than just an enemy. She makes her an honorary member of the Pony Club. Caroline looked at the little badge as it lay on the palm of Nannerl’s broad, stumpy hand. Suddenly she had an inspiration. There was just one thing she could do for the small German girl who had rendered her so great a service. Mary Treadgold’s children are, in a way which must have been rare for the time, substantially free from received opinions about nationalism. They learn, when kindness emerges, to recognise it for what it is no matter what its source. This piece is (mostly) taken from my book, Heroines on Horseback, published by Girls Gone By in 2013.